The Lodge is an architecturally designed, five bedroom, open-plan, split-level home, with an internal garden. It is colourful, artistic, airy, and clean. Rooms/beds are functional and welcoming. The owner, a woman lives on property. A housekeeper also lives on property. All staff at CR are knowledgeable and experienced at advising new visitors about travel around the island and things to do. They value and nurture a welcoming, genuine, and safe environment. CR is about fifteen minutes from most amenities and services in the City - beaches, airport, shopping, historic sites, however, to be fair - sometimes there is traffic. 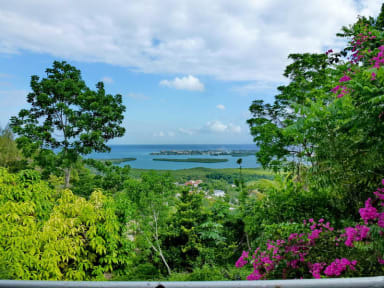 This location offers the visitor choices to either stay in to read or meditate or to have the information to move around the town/island/the Caribbean. The owners are also attuned to opportunities for volunteer work or community groups who would welcome visitors into their spaces. 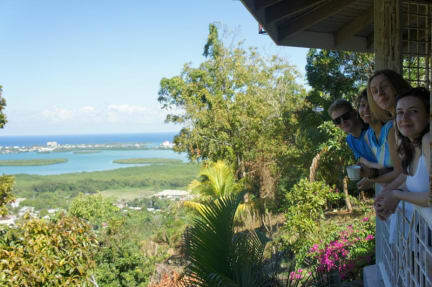 Staying at CR is more than just a place to stay, its a Jamaican experience in itself.